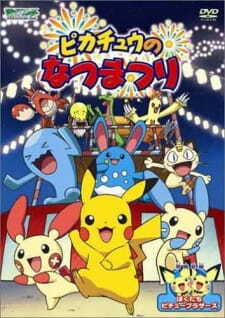 English: Pokemon: Pikachu's Summer Festival! Summer has arrived, and many Pokemon have set up shops for a summer festival on the beach. Soon the gang will be blessed by a special performance from the pop idol Azumarill, but upon her arrival, she's kidnapped by the flying Pokemon Skarmory! Pikachu, along with Plusle, Minun, Meowth, Wobbuffet and a number of other Pokemon must now track down the singing beauty; the show must go on! I had the audio in Japanese only, so I had no idea what was being said. Personally I don't like it when the voices of Pokémon are spoken by humans (and this is what they did here). Sure, in an all-Pokémon episode it is a great help when explaining the story, but in the main TV show they've managed without it just fine, bringing Meowth in to explain things if need be. The story was simple: Azumarill is coming to a Pokémon festival, but gets kidnapped by a Skarmory on the way there. A rescue mission is sent out to get back their signing star, and they face off against Sharpedo and Aggron. The art and sound were not in the same level as in the TV show or movies, but managed to bring the story to life nicely.